Hanamichi Sakuragi was born in 1968 in a family of the common working class. His mother passed away when he was very young, without the love of his mother he use the violence (out-on-the-street fights) to resolve his problems. As a young boy he was very tall at the age of 12 average 1.75 mts, and his body began to acquire force and a lot of resistance through his fights. Once he had a fight with the students in the sports zone of the University of Tokyo; his abilities to fight, velocity and tough physicality they attracted the coach of the basketball team, and offered him to join the team. In a party of practice, at the age of 17, against the National Team of Japan, Hanamichi of 1.89 mts, was the unique one that was not frightened by the professionals and noted 33 points alone: 10 shots, 3 nailed, 1 triple, 1 shot that did not find the terminology to explain, and 2 free shots. Although its team lost with only 59 points (59 - 115), had been an excellent first game for Hanamichi. Basketball was in chaos, and he was named "The Hope of the Japanese Basketball". Nevertheless, its father fell sick a year later. Hanamichi went of, return to Tokyo, and this trip would cost him all. He descended of the bus in Tokyo and he was on the verge of crossing the street across the hospital when a car that went very fast hit him. Although he had the "body of steel", the impact simply was too strong. He collapsed, they carried him to the hospital. Unfortunately it was too late... before they sent him to the operating room (he) died from internal hemorrhage, only with 18 years of age. The World of the Japanese Basketball was completely destroyed, they called this loss "Colossal". 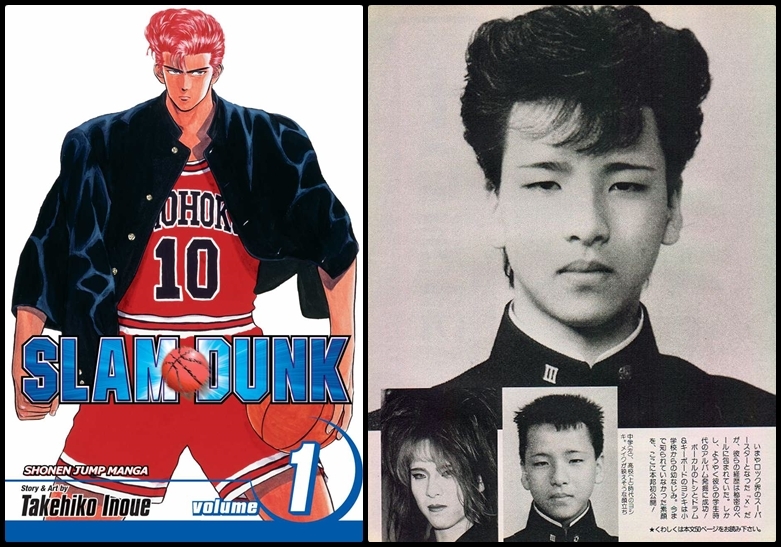 The mangaca Takehiko Inoue created its series" Slam Dunk" based on the history of his youth. Such a tragic, yet an inspiring story. So this is how the author of Slam Dunk Manga turned into TV Series, brought Hanamichi to life. Not sure where this story really came from, but the oldest one we saw online is on a Tsikot site (2007) . Good thing, we found an article that lead us to think otherwise. Hanamichi Sakuragi in the picture was actually a member of a band named X Japan. 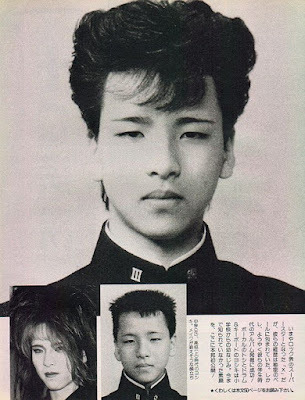 Yoshiki Hayashi, or Yoshiki, is the one actually in the picture who was thought by many as Hanamichi Sakuragi in real-life, who turned out to be just an urban legend.